Pumpkin gnocchi became famous in Italy in the late seventies thanks to skilled cooks eager to bring new innovations into the kitchen and at the same time, lighten traditional dishes. I ate this dish for the first time in February of 1979 at a restaurant called “Roma” in Tolmezzo. At that time, the owner and chef, Gianni Cosetti, was the great innovator of Carnia cuisine. Those gnocchi were wonderful. It tried to find a recipe, but it took a long time before I found one. 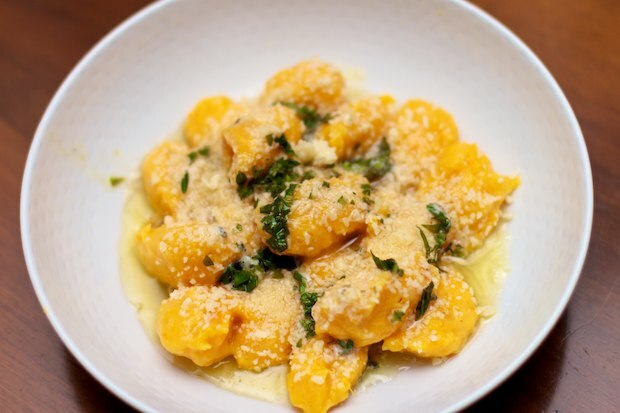 Now all the restaurants have pumpkin gnocchi on their menu, even the pizzerias. The recipe that I propose is simple and low in calories, simply don’t overload on the amount of sauce. I advise you to prepare this dish, if possible, in two stages. First clean and steam the pumpkin and the next day make the gnocchi. When I was served gnocchi at “Roma”, the dish was topped with grated smoked ricotta instead of parmesan. I use parmesan cheese because it is not easy to always have smoked ricotta in your refrigerator. However if you find it, try it because it works really well with these gnocchi. 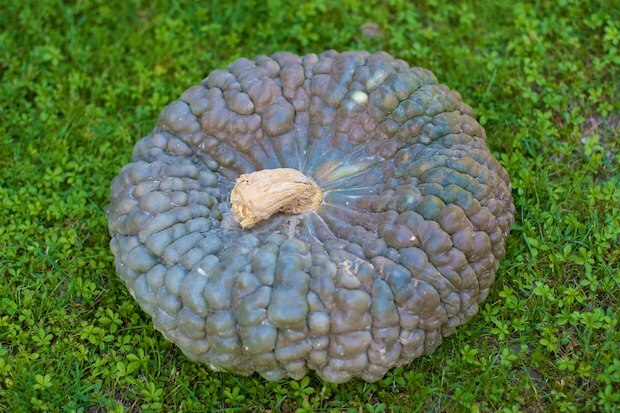 When you buy pumpkin, ask for the “Marina di Chioggia” variety, or at least a pumpkin with a flavorful non-aqueous pulp. Cook the pumpkin in a steaming basket. The time depends on the type of pumpkin. 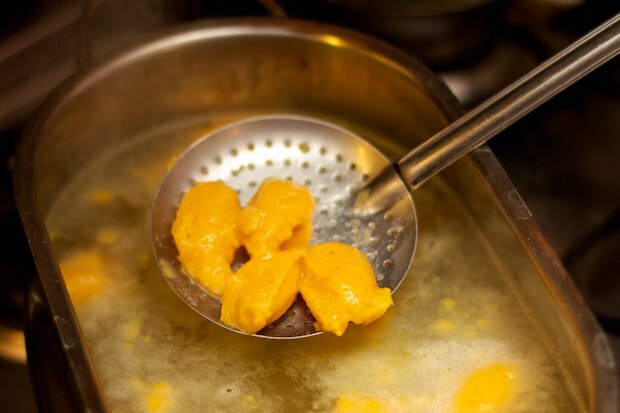 However, after 30 minutes of boiling, if you see that you can penetrate the pulp easily with a fork, it is ready. This compact variety with yellow flesh is ideal for gnocchi or ravioli filling, as a base for casseroles, or simply slices roasted in the oven with a little rosemary. Cooking this pumpkin in the oven brings out its flavor. Steam the pumpkin and let it cool. 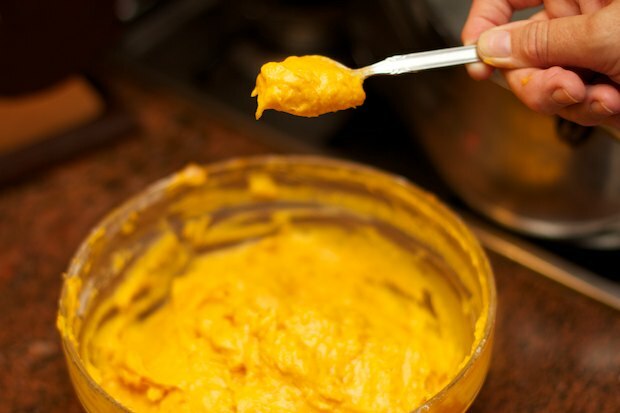 Reduce the pumpkin puree using a potato masher. 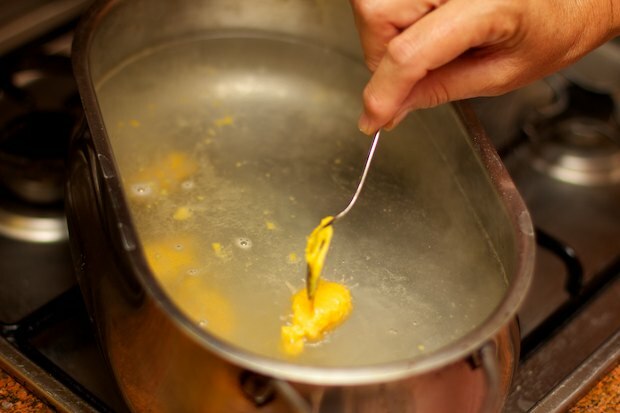 Add egg and flour, stirring the mixture so that no lumps are formed. Let the dough rest for 30 minutes. While the mixture rests, pour the water in a large pot with some salt. Melt the butter with the basil leaves in a saucepan. When the water boils, take a little of the pumpkin mix with a small spoon and with another spoon, scoop the gnocchi into the water. You should get around 15 gnocchi using this method. When they rise to the surface, they are cooked. Take them out using a slotted spoon and place them in individual serving bowls adding a bit of parmesan cheese, 1 tablespoon of melted butter, and a pinch of cut basil. Serve immediately. Proceed with the other gnocchi until you finish the mixture. If you do not want to serve the gnocchi in individual servings, add the gnocchi to a buttered baking dish and sprinkle with parmesan cheese and melted butter. Put in oven for 10 minutes to brown the top slightly. These steps must be performed very carefully because this type of gnocchi is very tender and can fall apart. Posted in Pasta and tagged with Gnocchi di Zucca, Pumpkin Gnocchi. RSS 2.0 feed. The gnocchi looks amazing – I’m definitely trying this recipe on the weekend. Just need to find a good pumpkin to use. I’d love to hear how it turns out. Let me know if the ingredient amounts made sense and what kind of pumpkin you found up there! Buoni! Li ho fatti a pranzo oggi, prima prova. Sono venuti bene!